We are pleased to announce the release of Rio en Medio's fourth album, titled Rio en Medio Radio. This album stands as a further step in Danielle's ongoing synthesis of found poetry, experimental composition and folk music influences. If you've ever heard her music before, the approach will not surprise you - organic, spartan baritone ukulele, guitar, cosmic keyboards and harmonizing vocals form the backbone of the songs. Here and there a friend drops in to play along - in this case, Terry Cox, original member of the 1960's folk-baroque band Pentangle (& contributing drummer for David Bowie, The Bee Gees) lends his nuanced approach on drums, while Dave Roe (Johnny Cash & the Tennessee Three) chimes in merrily on bass to fill the speakers at just the right moments. Nathan Shineywater (Library of Sands, BrightBlack Morning Light) contributes lead guitar and percussion in highlighted places. Harmonica is played by George Flynn, a 90+ year-old war veteran & former chauffeur for Hank Williams. Rio en Medio Radio convincingly weaves a path through time, picking up voices from the near and distant past and igniting meaning with subtle instrumentation. For the song "Terrapin Karma," 12th century troubadour poetry opens a traveller's diary. Its meandering lyric is met by earthbound lines from Thoreau's "Walden" and it somehow all makes sense. In the song "The Fox & The Little Prince" Danielle explores song creation inspired by a meeting of creatures in the book "The Little Prince" by Antoine de Saint-Exupéry. Track 7 "Darlin' Corey" sprites Flynn's harmonica Americana while an old Martin guitar & Danielle's dynamic storytelling takes the radio a pilgrim's way to old American song, while "Y Deryn Du" a Welsh folk ode to a blackbird, is medleyed with a timeless, anonymously-authored Italian song,"Sera Pasai". A surprising triumph found on the album with "Thread Song" where Terry Cox formulates his drum kit along with ukelele & pearly warm keyboards to a futuristic folk classic. With this year marking a decade since her first record, "Rio en Medio Radio" as album finds Danielle's original whimsy still in whimsy's place, experimental & thoughtful. Rio en Medio is the moniker of singer and musician Danielle Stech-Homsy. In her own words, Stech-Homsy's aim is to make music that "listens." The sparse arrangements often include ukulele, guitar, harmonium, found sounds and synthesizers, making room for Danielle's voice, her chosen words and the spatial atmosphere of the music. In 2003, Danielle Stech-Homsy, then a teacher and poet living in New York, made a series of self-produced song recordings called A Bride's Guide to Waiting Music. The sparse and atmospheric folk music, played on baritone ukulele and gently layered with found sounds, caught the ear of fellow musician Devendra Banhart, who inquired about releasing the record on his newly founded Gnomonsong label. With studio time and contributions from friends Sierra Casady (CocoRosie), Andy Cabic (Vetiver) and others, the album came to life under a new title, The Bride of Dynamite, and was noted as a unique highlight in the newly revived folk music scene. 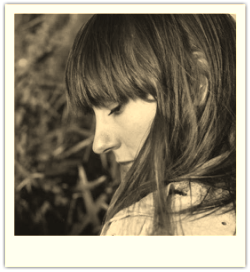 Since then, Danielle has recorded three more albums and toured in the US, Europe and Australia, supporting a variety of notable artists, including Vashti Bunyan, Linda Perhacs, CocoRosie, Brightblack Morning Light, Vetiver, Devendra Banhart, Patrick Wolf and Grizzly Bear. She has performed at several notable festivals including at All Tomorrow's Parties in England, curated by Devendra Banhart. Danielle has also contributed as a touring guest instrumentalist/singer in the bands Brightblack Morning Light and Cocorosie. In 2008, her sophomore LP Frontier was released on L.A.'s Manimal Vinyl label. Called by Pitchfork "hypnotic and captivating", Frontier melds Danielle's unique sense of melody with uke flourishes, brackish vintage synthesizers and organic dance beats in a landscape of sci-fi pop imaginings. Rio en Medio's 2013 album, PEACE SEQUENCE (WW Recordings), was recorded in her California desert studio and is a vibrant lull of guitar and vocal harmony with contributions from Japanese koto master SHOKO HIKAGE and psychedelic multi-instrumentalist Nathan Shineywater (Brightblack Morning Light, Library of Sands). Her latest record of young and old songs and some folk covers, entitled Rio en Medio Radio, will be released this fall.